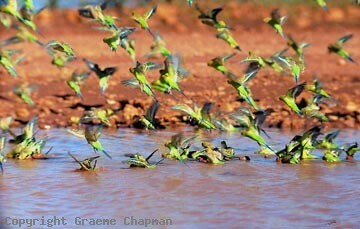 The Budgerigar is so familiar to all that it could be termed the quintessential Australian parrot. 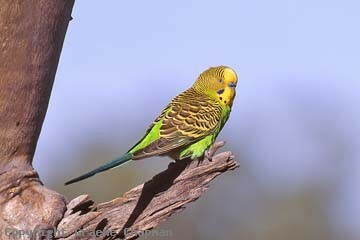 This common cage bird in all its different contrived colours may be familiar to most, but surprisingly few people know that the birds in the wild only sport the green and gold of Australia. 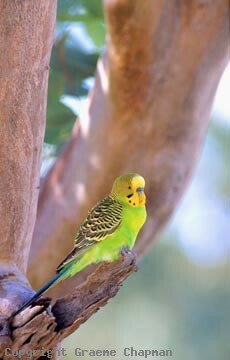 Wild "budgies"are one of Australia's true nomads, following the good times throughout the inland and only occasionally do you see them in coastal regions. Tree-lined watercourses are one of the favoured sites for nesting and in a good season, there can be a nest in nearly every tree, or even several nests in the one tree if necessary.The female alone prepares the nest and incubates the four to six eggs during which time the male brings her food (see pic 310208D). 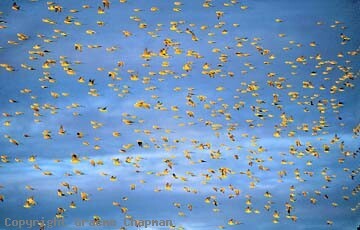 Budgerigars are certainly the most gregarious of all our parrots - rarely will you encounter just a few birds, large flocks occur even during the breeding season, but when they are on the move, flocks of many thousands are not unusual.